Don’t be misled by the long lines outside Ravenous. Crepes are quick to prepare and diners are served faster than you think. Because the boutique Phila Street eatery opens at 10:00 am, you’d be well advised to pass on the scrambled eggs sandwiches that are sold at the morning workouts in favor of brunch. Try the pommes frites with aioli sauce. On Sunday, although hungry for a confrontation between Zenyatta and Rachel Alexandra, Saratoga horse racing fans were served up the next best thing. At last, after being jilted once, they saw the Horse of the Year in a graded stakes – the $300,000 Gr.1. Personal Ensign. Rachel Alexandra was beat by a 20-1 shot. The longshot’s jockey wore the same colors that the jockey who rode Personal Ensign wore. There must be ghosts in the pine trees. It was eerily quiet as the horses paraded – almost dead still as they entered the stalls. Then a loud cheer went up as the horses broke from the barrier – the intensity gaining as each furlong passed. Most people expected Life at Ten to be the main competition, but she folded like origami as soon as the two hit the homestretch. If this was England, Calvin Borel would be penalized for the way he whipped Rachel Alexandra. Applause led the first two finishers back to their barns like the wave that you see at ballparks. Rachel Alexandra had her head bowed as if she was a bull stuck by a picador. The winner Persistently was more on her toes and wore a black blanket inscribed with a cherry red “P” for Phipps Stable. Many of the 23,347 fans wore rectangular buttons that welcomed their heroine back. As for the action before the main event, Bank Heist did what Rachel Alexandra could not. He confirmed the recent speed bias of the main track with a pillar to post victory. John R. Velazquez let the $900,000 Maria’s Mon three-year-old roll from the start of the fifth race and by the time he had rattled off four furlongs in 44.61 seconds, everyone could tell that he wouldn’t be caught. In the sixth race, Wow Wow Wow found the inner turf course equally speed favoring. Javier Castellano allowed no horse to get in front of his for the full mile they ran. The Broken Vow three-year-old, Marylou Whitney, D. Wayne Lukas and Castellano teamed up for the winner’s circle photo. Castellano may not win the rider’s title, but he’s had a dozen shining moments in the saddle. The veteran jockey’s ride aboard Cause of Freedom in the ninth race resulted in the closest of nose victories. His skill was as evident as it was for his victory aboard the Travers winner a day earlier. The one difference was about $56,000 to him for getting the job done. 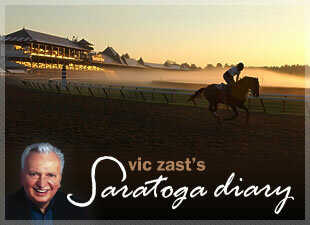 Vic Zast is the author of the award-winning book, “The History and Art of 25 Travers.” He’s a Saratoga Springs summer resident, who lives in Chicago during the off season.